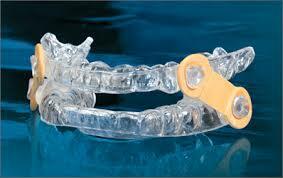 A Snore Guard is an anti-snoring device that claims to prevent snoring before it starts. It is a jaw retaining mouthpiece that is fitted over your teeth and while it is in your mouth, it holds your lower jaw forward while you sleep. There are many similar anti-snoring devices on the market. However, you really need a dental professional to help you decide which device would work best for you and use their skills to attain proper fit and adjustment. dentist because it has to be custom fitted to your mouth. Like most jaw retaining mouthpieces, this small intra-oral device is designed to prevent the jaw and tongue from falling back into the throat which restrict the air passage. This technique referred to as mandibular repositioning has been proven to eliminate airway obstruction and reduce or stop snoring.